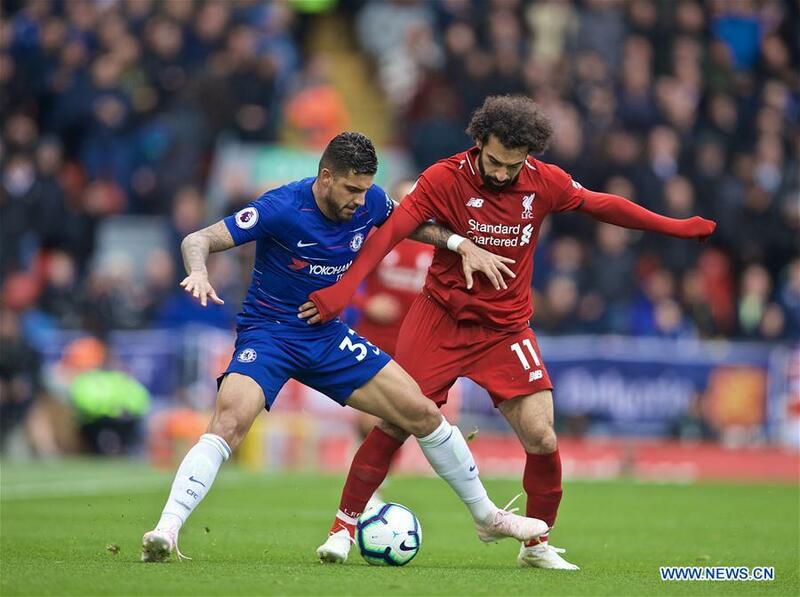 Knowing they needed a win in order to stay top of the table, Liverpool were 0-0 at home to Chelsea at the end of the first half of their game at Anfield. Sadio Mane broke the deadlock in a tense game six minutes into the second half with a far-post header, before Mohamed Salah brought the Liverpool fans to their feet with a stunning left-foot shot just four minutes later. The win keeps Liverpool ahead of Manchester City who had won 3-1 away to Crystal Palace with an efficient performance in a game which finished minutes before their match kicked off. Two goals from Raheem Sterling in the 15th and 63rd minute and one from Gabriel Jesus in injury time gave City three points against a side that had beaten them in the Ethiad Stadium earlier in the season. Tottenham made changes ahead of their Champions League visit to the Ethiad Stadium next week, but Mauricio Pochettino's side had few problems in handing out a 4-0 beating to already relegated Huddersfield. Lucas Moura netted a hat-trick as his side also took an important step to securing a top-four finish for next season as they returned to third in the table. Manchester United are also in the battle for the top four, although Ole Gunnar Solskjaer's side made hard work of West Ham, needing two penalties from Paul Pogba to give them a 2-1 win at Old Trafford. It wasn't the ideal performance to warm up for Tuesday's visit to the Camp Nou, and Solskjaer said as much afterwards. "With a performance like this we all know we will struggle in Barcelona, and we will have to improve," said the coach. Everton's hopes of finishing seventh and having the chance of playing in next season's Europa League suffered an unexpected setback as goals from Tom Cairney and Ryan Babbel saw them crash to a 2-0 defeat to Fulham. The south London side are also condemned to return to the Championship, but showed spirit to give Scott Parker his first success as coach. Burnley and Southampton cam probably start planning for another Premier League campaign after home wins over Cardiff and Wolves. Two goals from Chris Wood gave Burnley a 2-0 win over Cardiff to lift them 11 points clear of the team who are still third bottom, while Southampton have an eight-point cushion over Cardiff after Nathan Redmond netted twice in a 3-1 victory at home to Wolves. The final relegation spot now looks to be between Cardiff and Brighton after Brighton collapsed to a 5-0 defeat at home to Bournemouth. Brighton were already 2-0 down to goals from Dan Gosling and Ryan Fraser before Aaron Knockhaert was sent off and following his red card Brooks, Callum Wilson and Junior Stanislaus added to their misery. Friday saw Newcastle United win 1-0 away to Leicester City while Arsenal can return to the top four if they win away to Watford on Monday night.